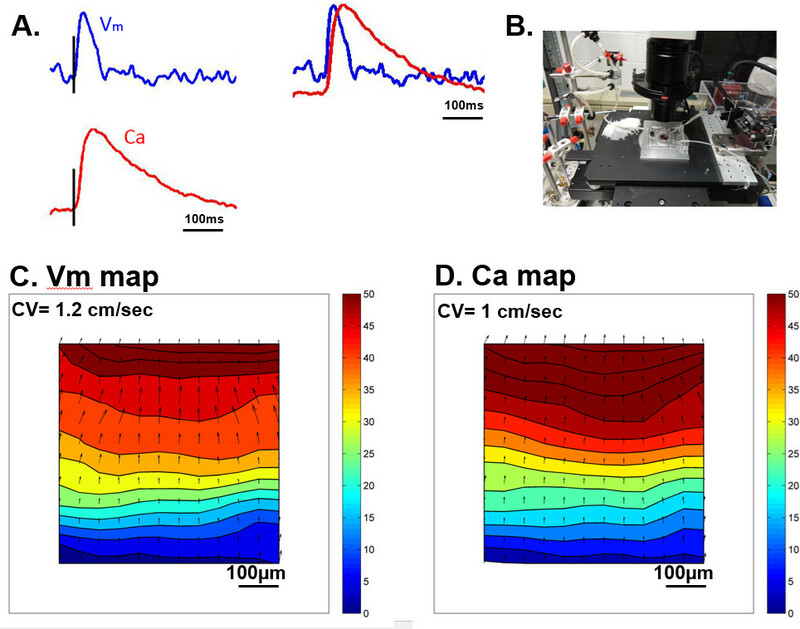 Yan, J., Thomson, J. K., Zhao, W., Fast, V. G., Ye, T., Ai, X. Voltage and Calcium Dual Channel Optical Mapping of Cultured HL-1 Atrial Myocyte Monolayer. J. Vis. Exp. (97), e52542, doi:10.3791/52542 (2015). Efimov, I. R., Nikolski, V. P., Salama, G. Optical imaging of the heart. Circ Res. 95, (1), 21-33 (2004). Salama, G., Hwang, S. M., et al. Simultaneous optical mapping of intracellular free calcium and action potentials from Langendorff perfused hearts. Current protocols in cytometry / editorial board, J. Paul Robinson, managing editor ... [et al.]. 12, (Unit 12 17), (2009). Laurita, K. R., Singal, A. Mapping action potentials and calcium transients simultaneously from the intact heart. Am J Physiol Heart Circ Physiol. 280, (5), H2053-H2060 (2001). Fast, V. G. Simultaneous optical imaging of membrane potential and intracellular calcium. J Electrocardiol. 38, (4 Suppl), 107-112 (2005). Sowell, B., Fast, V. G. Ionic mechanism of shock-induced arrhythmias: role of intracellular calcium. Heart Rhythm. 9, (1), 96-104 (2012). Fast, V. G., Kleber, A. G. Microscopic conduction in cultured strands of neonatal rat heart cells measured with voltage-sensitive dyes. Circ Res. 73, (5), 914-925 (1993). Hou, L., et al. A major role for HERG in determining frequency of reentry in neonatal rat ventricular myocyte monolayer. Circ Res. 107, (12), 1503-1511 (2010). Beauchamp, P., et al. Relative contributions of connexins 40 and 43 to atrial impulse propagation in synthetic strands of neonatal and fetal murine cardiomyocytes. Circ Res. 99, (11), 1216-1224 (2006). Xia, M., et al. Functional expression of L- and T-type Ca2+ channels in murine HL-1 cells. J Mol Cell Cardiol. 36, (1), 111-119 (2004). Claycomb, W. C., et al. HL-1 cells: a cardiac muscle cell line that contracts and retains phenotypic characteristics of the adult cardiomyocyte. Proc Natl Acad Sci U S A. 95, (6), 2979-2984 (1998). Fahrenbach, J. P., Ai, X., Banach, K. Decreased intercellular coupling improves the function of cardiac pacemakers derived from mouse embryonic stem cells. J Mol Cell Cardiol. 45, (5), 642-649 (2008). Yan, J., et al. c-Jun N-terminal kinase activation contributes to reduced connexin43 and development of atrial arrhythmias. Cardiovasc Res. 97, (3), 589-597 (2013). White, S. M., Constantin, P. E., Claycomb, W. C. Cardiac physiology at the cellular level: use of cultured HL-1 cardiomyocytes for studies of cardiac muscle cell structure and function. Am J Physiol Heart Circ Physiol. 286, (3), H823-H829 (2004). Yang, Z., Shen, W., Rottman, J. N., Wikswo, J. P., Murray, K. T. Rapid stimulation causes electrical remodeling in cultured atrial myocytes. J Mol Cell Cardiol. 38, (2), 299-308 (2005). Brundel, B. J., Kampinga, H. H., Henning, R. H. Calpain inhibition prevents pacing-induced cellular remodeling in a HL-1 myocyte model for atrial fibrillation. Cardiovasc Res. 62, (3), 521-528 (2004). Umapathy, K., et al. Electrogram fractionation in murine HL-1 atrial monolayer model. Heart Rhythm. 5, (7), 1029-1035 (2008). Fast, V. G., Cheek, E. R. Optical mapping of arrhythmias induced by strong electrical shocks in myocyte cultures. Circ Res. 90, (6), 664-670 (2002). Bayly, P. V., et al. Estimation of conduction velocity vector fields from epicardial mapping data. IEEE Trans Biomed Eng. 45, (5), 563-571 (1998).